Villa Gecko is situated on the Eastern of the exclusive Origo Mare development. The location is simply stunning, with views of the wild Atlantic and Lanzarote to the north contrasting with the harsh beauty of extinct volcanoes along the Eastern horizon. As of July 2014, Pierre et Vacances (part of Centre Parcs) have purchased a number of properties on Origo Mare and built facilities including bars and a water park. When you stay at Villa Gecko we will provide you with details of entrance fees should you so wish. The villa’s location is on the northern shore of Fuerteventura roughly equidistant between Corralejo and El Cotillo and some 10 minutes drive north of Lajares. Fuerteventura is the closest Canary Island to the African coast with only 100km separating Punta de la Entillada from Cape Juby in Morocco and is the second largest (after Tenerife) of all the islands. Fuerteventura is on the same latitude as Florida and Mexico which probably accounts for the almost 3000hours of sunshine each year. Fuerteventura is encompassed by warm crystal clear water and over 150 sandy beaches. 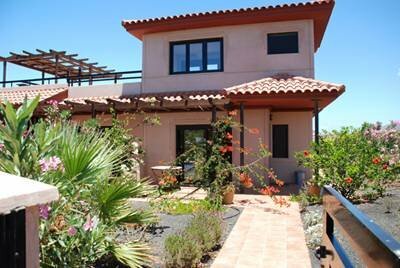 Villa gecko is perfectly placed for those who wish to discover the island of Fuerteventura at its best. There is nowhere in the Canaries with as many enormous sand dunes and long sandy beaches making this island and ideal holiday destination. This remarkable location means that car hire is essential to enjoy your tsay although the nearest village with restaurants, shops and excellent ‘supermercado’ is less than 10 minutes by car or 1 hour walking. This is a two bed room villa with private gardens and terraces. The villa is newly built which means that the furnishing and fittings are modern and sparkle with the innocence of newness. The villa is comfortably furnished ensuring that your tsay will be relaxing and stress free. The lounge opens onto the terrace complete with outdoor furniture allowing you to enjoy al fresco dining at its best. The lounge area boasts satellite Tv and DVD player. There is a small collection of DVD’s and CD’s to enjoy should you so wish. A fully fitted kitchen includes a ceramic hob, full size oven, fridge freezer, dishwasher, automatic washing machine, toaster, kettle and a wide range of cooking utensils and equipment. From the double bedroom upstairs, with fully fitted wardrobes, you can step out onto the spacious upper terrace. At night you can view the distant lights of Playa Blanca against the stunning back dro p of the night sky. The twin bedroom downstairs, also with fully fitted wardrobes, opens onto the rear garden again offering views across to Lanzarote and the mountains. There is a stylish and modern bathroom on both the ground and first floor, each with bath, shower, toilet, bidet and full size sink. The villa is equipped with two portable fans one of which can blow the hairs off a gooseberry at three hundred paces. Trust us, you will not get too hot! In addition to extensive sea views and easy access to miles of unspoilt coastline, residents can enjoy the spacious landscaped grounds with villas set in oasis areas, each with its own infant and full size swimming pools, tennis and paddle courts. There is ample off road parking, and the complex infrastructure facilitates the use of wheel chairs and pushchairs. Villa Gecko is just a few minutes walk from Majanicho a small fishing village that so far has remained unspoilt without any form of commercialisation. The coast line here makes it ideal for those wishing to take advantage of what can only be described as a surfers paradise with its great rolling waves. It is also a great place for walkers the volcanic scenery is spectacular, with views across the sea to Lanzarote. Lajares is the last village before you reach Origo Mare and the Villa Gecko but it is well worth a visit. At the very least you have to visit the Panaderia which has a mouthwatering range of cakes and pastries that just have to be eaten along with their tasty bread. Lajares was the centre of lace making on the island and there are still demonstrations carried out daily of this long established craft that is like so many is dying out. The village also has plenty of amenities including a good supermarket as well as local bars and restaurants. For those that are into water sports it also has some of the best surf shops on the island. El Cotillo. El Cotillo typifies the relaxed way of life on the island. In the new harbour local fishing boats still work the surrounding waters. To the north of El Cotillo are a group of pure white sand coves that make a great place to spend especially for those with families. To the south the cliff walks provide plenty of interest for the walkers, whilst the beaches ideal for surfers. To the east of villa Gecko lies Corralejo, only a fifteen to twenty minute drive. Corralejo has something to suit all tastes great restaurants and bars that cater for all tastes from local to the exotic many of them are located along the edge of the harbour providing great alfresco dinning. For those wanting to shop the streets of Corralejo provide a great place to while a way the hours. If you are looking for something more strenuous then why not try a water sport. Why not have a go at kite or windsurfing, snorkelling. diving or perhaps a jet ski. Regular ferries make the short trip to Lanzarote go on a Monday or Friday if you want to visit the markets. There are also daily boat trips to the island of Los Lobos. Located high up in the hills on the FV30 Bentacuria is well worth a visit if for no other reason than spectacular views as you wind your way up along the edge of the mountains to reach it. Once there you will not be disappointed the focal point of the village is the Santa Maria Church rebuilt in 1691. The decorated ceilings inside the church are really quite special. There are some lovely restaurants nearby as well as the museum and craft centre. Situated less than 100yds from Villa Gecko near the pool there is a Tennis Court and a Paddle Court that can be used at any time during your stay at Villa Gecko. A Paddle Court is smaller than a tennis court, and has simpler markings. The court is surrounded by glass with a high back end, a squash court in the sun. It can be played either as singles or doubles with the scoring similar to tennis played over three sets. The biggest difference between it and tennis is the bat which looks like a giant table tennis bat, and the service is underhand rather than overhand. When it comes to surfing The Canary Islands richly deserves the title of "The Hawaii of the Atlantic". The volcanic rock of the island is hit by ocean swells from three directions producing waves that are among the best in the world. Add to the mix the constant warm sunshine and crystal clear water and you really do have something special. Take a surf board combine it with a kite to harness the power of the wind and now you are Kite Surfing. Along the beach to the south of Corralejo the spectacular coloured kites can be seen for miles as they dance around the sky while they pull surfer and board along. Many taking to the air as they perform tricks suspended beneath a canopy of multicoloured silk. There are many different companies offering expert advice and tuition one such company Ventura Surf offer a range of courses as well as equipment hire. Not happy with using a kite to power your surf board, then why not use a sail instead? Now you really can skim along the water at high speed. Unlike a rudder-steered sailing boat, a wind surfer is steered by tilting and rotating the mast and sail as well as tilting and carving the board. Those with more experience can even make these take to the air as well performing some great tricks. Diving the crystal clear warm waters around Fuerteventura is a fantastic experience. With a constant water temperature around the Canary Islands of between 18 and 20 degrees all year round conditions could not be better for the aquatic ecosystem that exists around Fuerteventura providing a vast and wonderful collection of marine life. For the beginner though a word of warning once you have made that first dive and seen the beauty of the plant and fish life in the underwater world you will be hooked on this exciting sport. Fuerteventura has plenty to offer both the beginner and the more experienced diver there are dozens of companies to choose from. Abyss Divers offer a range of dives and training from the beginner to the more experienced diver as well as equipment hire. Currently Fuerteventura has two 18 hole golf courses a third is currently being built around Villa Gecko. Both the existing courses are located next to each other in Caleta de Fuste. Elba Palace Golf Resort despite only opening in the spring of 2002 it hosted the Spanish Open in 2004. The 18 hole course wanders over streams and lakes as it meanders its way between villas. The front nine holes are fairly flat whilst the back nine are more elevated as the course climbs up the hill. to the side of the 18th tee there are some great views. The tee itself has been cut back into the hill making this tricky left hand dog leg par 4 even more difficult. The decision whether to go for glory and cut the left hand corner over the trees and garden fences in an attempt to hit the green in one (which cant be seen from the tee) for that birdie opportunity. Or to lay up at the bottom of the hill (which again cant be seen from the tee) and play the safer option though even this is not such an easy shot as it first appears. To short and the dog leg comes into play, to long and your in the long rough behind the trees with no way forward towards the tee. The choice of shot is down to the individual. Whichever you choose though it comes as a a fitting end to a good round of golf. The second course was only finished in 2006 and offers a different challenge. The course is an 18 hole par 70 6049 meters. Made up of two loops of nine holes each starting and finishing at the clubhouse. The course has three large lakes connected by a stream that also comes into play on a lot of the holes. Layout of the course is basically flat with exception of the 17th and 18th holes. The 17th a par 5 that rises to a well protected green. The 18th then provides a tricky downhill dogleg back to the clubhouse par 4. Quad bikes provide a great way to explore the area between Corralejo and El Cotillo. Not only are they great fun but they easily take you across the volcanic rock to places that you would not normally get to.